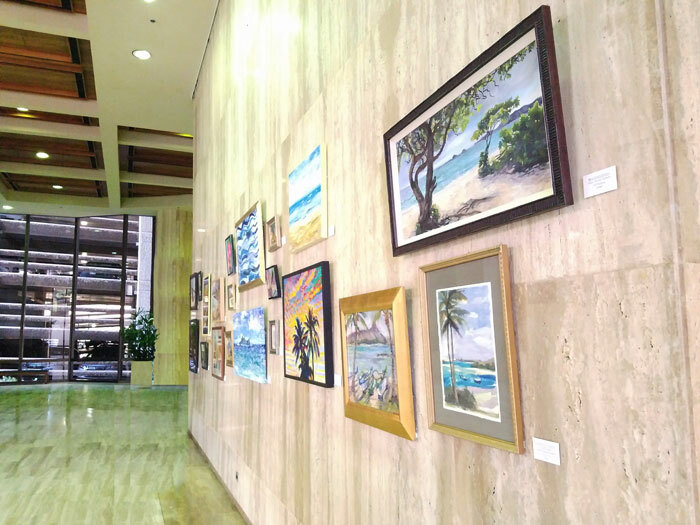 In August, I helped once again to organize and design the hanging schema for Windward Artists Guild’s new show at Pauahi Tower’s gorgeous second floor space. 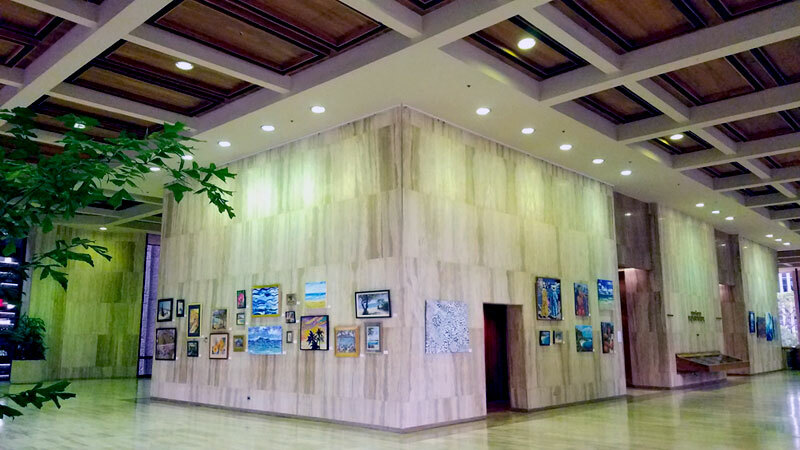 Covered in beautiful travertine stone and topped by soaring coffered ceilings, the spacious venue allows WAG artists to show their large works which offer a valuable interior design option for offices and homes and the chance to collect major works from talented local artists. “Beach Sentinels”, my piece is at top right. At the moment, I have one large piece in the show (above at top right), but may add a couple of smaller works later in the show. Speaking of small works, we have a lot of size range in this particular show to fit a wider range of budgets. I think it is a nice compromise between the larger works (more rare in most galleries here) and the smaller work, perfect for gifts as the Holiday season comes closer. Some of our top plein air artists are in this show, so it’s a must-see for those who love small plein air pieces! The show also has a lot of diversity in 2D genres. There are landscapes, abstracts, florals, portraits, stilllifes, and more. What I am most excited about is the flow of the paintings together within the space. I hope as you view the show, you enjoy the juxtapositions and groupings that are designed to let each piece shine while adding harmonious or interesting collaborative elements to the wall as a whole. Grouping works to maximize the beauty and individuality of each piece, and not letting one piece dominate the wall is a difficult but highly satisfying goal. I often go in with a plan and then invite others to help refine the plan – they never disappoint – the final show is the result of the guild’s refinement of my initial ideas, and together we made the show arrangement work very well within this great venue! All works are for sale and 15% of those sales are donated to Windward Artists Guild whose mission since 1960 has been to stimulate the visual arts on Oahu. We will use the proceeds to fund our education grants, workshops, and to help sponsor art events that are beneficial to the community. The Ultra Exhibit is on the second floor (up the escalators or elevators). Parking entrance is on the left at approximately 1080 Alakea Street (Bishop Square Parking), or you may park in public parking at Alii Place across the street if you prefer a more affordable option with a small walk. This entry was posted in Art Shows by WendyRobertsFineArt. Bookmark the permalink.